CFIF recently highlighted the importance of strengthening intellectual property rights as part of ongoing trade negotiations in a piece entitled “Intellectual Property: NAFTA Renegotiation Priority #1.” Days later, Senator Pat Toomey (R – Pennsylvania) echoed that call in his Wall Street Journal commentary. It’s an excellent piece worth the read, and a welcome call from someone to whom the White House listens. Inexplicably, the U.S. Senate this week narrowly moved to restore 2015 Obama Administration Federal Communications Commission (FCC) crony capitalist internet regulations. 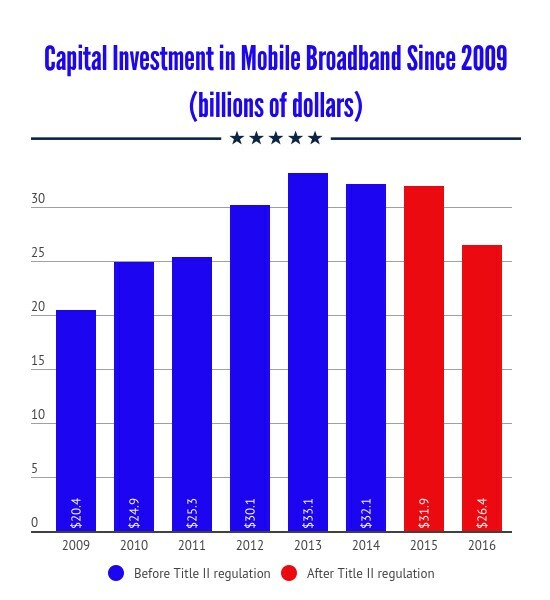 Here’s the effect that Obama FCC regulation immediately had on mobile broadband investment. It’s now the duty of the House of Representatives and the Trump Administration to kill this mindless Obama-era attempt to regulate the internet, and we encourage everyone to contact their Representatives and the White House to demand that action. ALEXANDRIA, VA – This week, Senator Mike Lee (R – Utah) introduced the Standard Merger and Acquisition Reviews Through Equal Rules (SMARTER) Act in the United States Senate. Among other advancements, the SMARTER Act will address concerns that parties to a proposed merger or acquisition endure different injunction standards in court challenges, as well as different processes, depending upon which federal antitrust agency happens to be reviewing the transaction. The Center for Individual Freedom applauds Senator Mike Lee on the introduction of the SMARTER Act of 2018. Among other improvements, this bill includes key reforms to the flawed Federal Communications Commission’s (FCC’s) merger review process, including: 1) establishing a reasonable time limit for agency review to ensure fairer, more transparent and timely decisions, and 2) ending the ability to effectively kill transactions by designating them for hearing before Administrative Law Judges, instead requiring such cases to be litigated in federal court just as the Justice Department must when contesting proposed transactions. CFIF urges quick Senate passage of the commonsense legislation.